Product prices and availability are accurate as of 2019-02-02 20:51:40 UTC and are subject to change. Any price and availability information displayed on http://www.amazon.com/ at the time of purchase will apply to the purchase of this product. These are replacement screws, nuts, and hanging loops for vintage era (two screw type) Revere Ware pan handles. They are specifically made for the three largest sizes of Revere Ware handles and WILL NOT WORK on the small handle size. 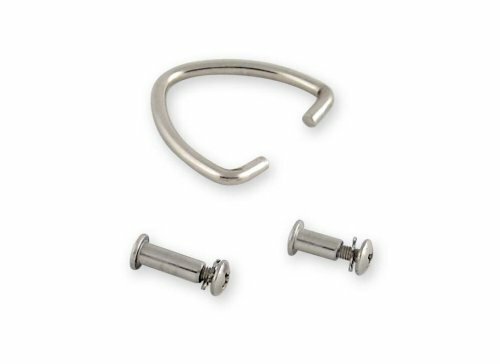 These parts are newly manufactured and are made to look and work just like original Revere Ware hardware, with the exceptions noted below. Includes TWO COMPLETE SETS, enough for two separate pans. Material: Stainless steel Includes: Two sets of: two nuts, two screws, and a hanging hook; enough for two separate pans. Fits: Vintage era medium, large, and x-large skillet and pan handles. These fit Revere Ware pans with handles that have two screws through the Bakelite where the two screws are at opposite ends of the handle. These screws will only work with the medium, large, and x-large two-screw vintage style handle. Notes The screws in the hardware set are Phillips head, not slotted like the original Revere Ware screw sets were. Because the original slot head screws strip very easily, we consider this an improvement. Installation Notes In some cases, the old screws can rust together and are very hard to get off. Twisting the screw also twists the nut on the other side. You can try pressing a slotted screwdriver between the edge of the nut and the Bakelite to create some resistance to keep the nut from turning, but if it is truly corroded, the only real solution we've found is to break the Bakelite off by prying between the two halves with a screwdriver. Once the Bakelite is off, you can grab the nut with pliers.